Let’s talk a little bit about cameras in Houdini. Most of the time cameras will be coming from other 3D apps or tracking/matchmoving apps. The most common file format then it would be alembic. Apparently alembic cameras are not very welcome in Houdini, don’t ask me why, but there are certain issues that might occur. In my experience most visual effects companies have their own way to import alembic cameras. I have never used fbx cameras in a professional environment but I have done a few tests at home and it seems to work fine. So, if you get weird issues using alembic maybe fbx could be a solution for your particular case. Go to file -> import to do so. To create cameras in Houdini use the camera node. Here are some important features to consider when working with cameras in Houdini. If you need to scale the camera, not very common but it can happen, do not scale the camera itself, just connect a null to the camera and transform the null instead. Render resolution is set in the camera attributes. It can be overwritten in the ROP node but by default it uses the camera resolution. There are different types of camera projection, perspective, orthographic, etc. There is also a spherical lens preset in case you need to render equirectangular panoramas. Near/far clipping, same as every 3d app, important when working with big/small scales. Background image: It places an image in the background that actually gets render. Usually you don’t want this to happen for final rendering. If you disable this option, the image won’t be visible during render time but it still will be visible in the viewport. Use the below icon to disable it. To see safe areas go to display -> guides (display is d key). In a previous post I mentioned the importance of having high frequency details whilst scanning assets on-set. Sometimes if we don't have that detail we can just create it. Actually sometimes this is the only way to capture volumes and surfaces efficiently, specially if the asset doesn't have any surface detail, like white objects for example. If we are dealing with assets that are being used on set but won't appear in the final edit, it is probably that those assets are not painted at all. There is no need to spend resources on it, right? But we might need to scan those assets to create a virtual asset that will be ultimately used on screen. As mentioned before, if we don't have enough surface detail it will be so difficult to scan assets using photogrammetry so, we need to create high frequency detail on our own way. Let's say we need to create a virtual assets of this physical mask. It is completely plain, white, we don't see much detail on its surface. We can create high frequency detail just painting some dots, or placing small stickers across the surface. In this particular case I'm using a regular DSLR + multi zoom lens. A tripod, a support for the mask and some washable paint. I prefer to use small round stickers because they create less artifacts in the scan, but I run out of them. I created this support while ago to scan fruits and other organic assets. The first thing I usually do (if the object is white) is covering the whole object with neutral gray paint. It is way more easy to balance the exposure photographing again gray than white. Once the gray paint is dry I just paint small dots or place the round stickers to create high frequency detail. The smallest the better. Once the material has been processed you should get a pretty decent scan. Probably an impossible task without creating all the high frequency detail first. Quick tip here. Whenever possible use some kind of high frequency detail to capture references for your assets. In this scenario I'm scanning with photos this huge rock, with only 50 images and very bad conditions. Low lighting situation, shot hand-held, no tripod at all, very windy and raining. Thanks to all the great high frequency detail on the surface of this rock the output is quite good to use as modeling reference, even to extract highly detailed displacement maps. Notice in the image below that I'm using only 50 pictures. Not much you might say. But thanks to all the tiny detail the photogrammetry software does very well reconstructing the point cloud to generate the 3D model. There is a lot of information to find common points between photos. The shooting pattern couldn't be more simple. Just one eight all around the subject. The alignment was completely successfully in Photoscan. As you can see here, even with a small number of photos and not the best lighting conditions, the output is quite good. I did an automatic retopology in Zbrush. I don't care much about the topology, this asset is not going to be animated at all. I just need a manageable topology to create a nice uv mapping and reproject all the fine detail in Zbrush and use it later as displacement map. Mi friend David Munoz Velazquez just pointed me to this great script to flatten geometries based on UV Mapping, pretty useful for re-topology tasks. In this demo I use it to create nice topology for 3D garments in Marvelous Designer. Then I can apply any new simulation changes to the final mesh using morphs. Check it out. 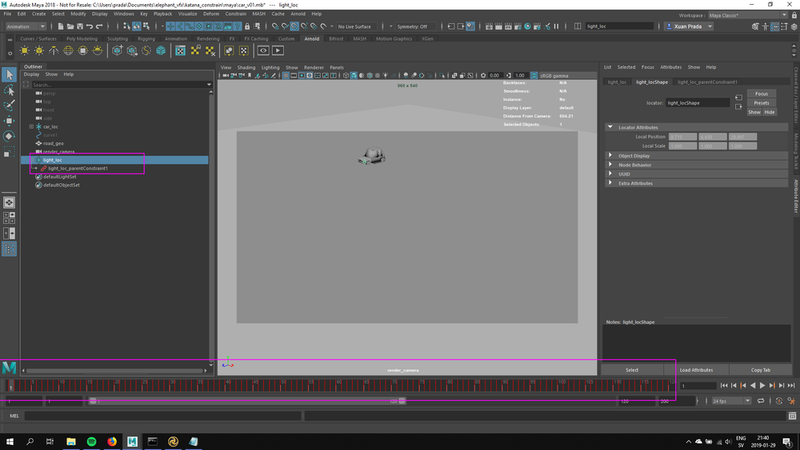 This is a very simple tutorial explaining how to render particle systems simulated in Maya inside Isotropix Clarisse. I already have a few posts about using Clarisse for different purposes, if you check by the tag "Clarisse" you will find all the previous posts. Hope to be publishing more soon. In this particular case we'll be using a very simple particle system in Maya. We are going to export it to Clarisse and use custom geometries and Clarisse's powerful scatterer system to render millions of polygons very fast and nicely. Once your particle system has been simulated in Maya, export it via Alembic. One of the standard 3D formats for exchanging information in VFX. Create an IBL rig in Clarisse. In a previous post I explain how to do it, it is quite simple. With Clarisse 2.0 it is so simple to do, just one click and you are ready to go. Go to File -> Import -> Scene and select the Alembic file exported from Maya. It comes with 2 types of particles, a grid acting as ground and the render camera. Create a few contexts to keep everything tidy. Geo, particles, cameras and materials. In the geo context I imported the toy_man and the toy_truck models (.obj) and moved the grid from the main context to the geo context. Moved the 2 particles systems and the camera to their correspondent contexts. In the materials context I created 2 materials and 2 color textures for the models. Very simple shaders and textures. In the particles context I created a new scatterer calle scatterer_typeA. In the geometry support of the scatter add the particles_typeA and in the geometry section add the toy_man model. I’m also adding some variation to the rotation. If I move my timeline I will see the particle animation using the toy_man model. Do not forget to assign the material created before. Create another scatterer for the partycles_typeB and configure the geometry support and the geometry to be used. Add also some rotation and position variation. As these models are quite big compared with the toy figurine, I’m offsetting the particle effect to reduce the presence of toy_trucks in the scene. Before rendering, I’d like to add some motion blur to the scene. Go to raytracer -> Motion Blur -> 3D motion blur. Now you are ready to render the whole animation. This is a very quick demo of how to install on Mac and use the gizmo mmColorTarget or at least how I use it for my texturing/references and lighting process. The gizmo itself was created by Marco Meyer. This is a very quick and dirty explanation of how the footage and specially colour is managed in a VFX facility. The RAW material recorded on-set goes to the lab. In the lab it is converted to .dpx which is the standard film format. Sometimes the might use exr but it's not that common. A lot of movies are still being filmed with film cameras, in those cases the lab will scan the negatives and convert them to .dpx to be used along the pipeline. The RAW material recorded on-set goes to dailies. The cinematographer, DP, or DI applies a primary LUT or color grading to be used along the project. Original scans with LUT applied are converted to low quality scans and .mov files are generated for distribution. Editorial department receive the low quality scans (Quicktimes) with the LUT applied. They use these files to make the initial cuts and bidding. VFX facilities receive the low quality scans (Quictimes) with LUT applied. They use these files for bidding. Later on they will use them as reference for color grading. Lab provides high quality scans to the VFX facility. This is pretty much RAW material and the LUT needs to be applied. The VFX facility will have to apply the LUT's film to the work done by scratch by them. When the VFX work is done, the VFX facility renders out exr files. DI will do the final grading to match the Editorial Quicktimes. High quality material produced by the VFX facility goes to Editorial to be inserted in the cuts. The basic practical workflow would be. Dpx scans usually are in LOG color space. Exr scans usually are in LIN color space. 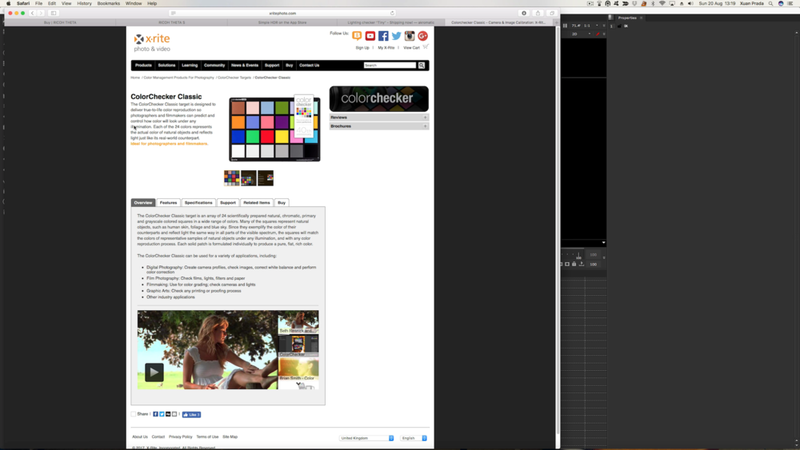 Apply LUT and other color grading to the RAW scans to match the Quicktime scans. Render out to Editorial using the same color space used for bringing in footage. Render out Quicktimes using the same color space used for viewing. If wathcing for excample in sRGB you will have to bake the LUT. In this post I'm going to explain my methodology to merge different pictures or portions of an environment in order to create a panoramic image to be used for matte painting purposes. I'm not talking about creating equirectangular panoramas for 3D lighting, for that I use ptGui and there is not a better tool for it. I'm talking about blending different images or footage (video) to create a seamless panoramic image ready to use in any 3D or 2D program. It can be composed using only 2 images or maybe 15, it doesn't matter. This method is much more complicated and requires more human time than using ptGui or any other stitching software. But the power of this method is that you can use it with HDR footage recorded with a Blackmagic camera, for example. The pictures that I'm using for this tutorial were taken with a nodal point base, but they are not calibrated or similar. In fact they don't need to be like that. Obviously taking pictures from a nodal point rotation base will help a lot, but the good thing of this technique is that you can use different angles taken from different positions and also using different focal and different film backs from various digital cameras. I'm using these 7 images taken from a bridge in Chiswick, West London. The resolution of the images is 7000px wide so I created a proxy version around 3000px wide. All the pictures were taken with same focal, same exposure and with the ISO and White Balance locked. We need to know some information about these pictures. In order to blend the images in to a panoramic image we need to know the focal length and the film back or sensor size. Connect a view meta data node to every single image to check this information. In this case I was the person who took the photos, so I know all of them have the same settings, but if you are not sure about the settings, check one by one. I can see that the focal length is 280/10 which means the images were taken using a 28mm lens. I don't see film back information but I do see the camera model, a Nikon D800. If I google the film back for this camera I see that the size is 35.9mm x 24mm. Create a camera node with the information of the film back and the focal length. At this point it would be a good idea to correct the lens distortion in your images. You can use a lens distortion node in Nuke if you shot a lens distortion grid, or just do eyeballing. In my case I'm using the great lens distortion tools in Adobe Lightroom, but this is only possible because I'm using stills. You should always shot lens distortion grids. Connect a card node to the image and remove all the subdivisions. Also deactivate the image aspect to have 1:1 cards. We will fix this later. Connect a transfer geo node to the card, and it's axis input to the camera. If we move the camera, the card is attached to it all the time. Now we are about to create a custom parameter to keep the card aligned to the camera all the time, with the correct focal length and film back. Even if we play with the camera parameters, the image will be updated automatically. This will allow us to place the card in space always relative to the camera. Now if we play with the custom distance value it works. Now we have to refer to the film back and focal length so the card matches the camera information when it's moved or rotated. In the x scale of the transform geo node type this expression (input1.haperture/input1.focal)*distance and in the y scale type: (input1.vaperture/input1.focal)*distance being input1 the camera axis. Now if we play with the distance custom parameter everything is perfectly aligned. Create a group with the card, camera and transfer geo nodes. Remove the input2 and input3 and connect the input1 to the card instead of the camera. Go out of the group and connect it to the image. There are usually refreshing issues so cut the whole group node and paste it. This will fix the problem. Also pick the rotation from the camera and the distance from the transfer geo. Having these controls here we won't have to go inside of the group if we need to use them. And we will. Create a project 3D node and connect the camera to the camera input and the input1 to the input. Create a sitch node below the transfer geo node and connect the input1 to the project3D node. Add another custom control to the group parameters. Use the pulldown choice, call it mode and add two lines: card and project 3D. Put the mode to project 3D. Add a sphere node, scale it big and connect it to the camera projector. You will se the image projected in the sphere instead of being rendered in a flat card. In this tutorial we are going to use the card mode. For now leave it as card and remove the sphere. Set the camera in the viewport and lock it. Now you can zoom in and out without loosing the camera. Set the horizon line playing with the rotation. Copy and paste the camera projector group and set the horizon in the next image by doing the same than before; locking the camera and playing with camera rotation. Create a scene node and add both images. Check that all the images have an alpha channel. Auto alpha should be fine as long as the alpha is completely white. Look through the camera of the first camera projector and lock the viewport. Zoom out and start playing with the rotation and distance of the second camera projection until both images are perfectly blended. Repeat the process with every single image. Just do the same than before; look through the previous camera, lock it, zoom out and play with the controls of the next image until they are perfectly aligned. Create a camera node and call it shot camera. Create a scanline render node. Connect the obj/scene input of the scanline render to the scene node. Connect the camera input of the scanline render to the shot camera. Connect the reformat node to the bg input of the scanline render node. Look through the scanline render in 2D and you will see the panorama through the shot camera. Play with the rotation of the camera in order to place the panorama in the desired position. That's it if you only need to see the panorama through the shot camera. But let's say you also need to project it in a 3D space. Create another scanline render node and change the projection mode to spherical. Connect it to the scene. Create a reformat node with an equirectangular format and connect it to the bg input of the scanline render. In this case I'm using a 4000x2000 format. Create a sphere node and connect it to the spherical scanline render. Put a mirror node in between to invert the normal of the sphere. Create another scanline render and connect it's camera input to the shot camera. Connect the bg input of the new scanline render to the shot reformat node (super 35). Connect the scn/obj of the new scanline render and connect it to the sphere node. That's all that you need. You can look through the scanline render in the 2D and 3D viewport. We got all the images projected in 3D and rendered through the shot camera. You can download the sample scene here.